Back in the ‘Round the bend‘ post, we’d seen that we start out at circuit 3, Control – the first stage of training, in fact, despite the implications of its name. It then gets worse for quite a while once we make the turn outward to circuit 2, Self, and outward again to what is often the worst part of learning a skill, ‘on the outer’ in circuit 1, Survival. The same pattern repeats further in: after the double-jump inward from Survival, to circuit 4, Caring, to circuit 7, Meditation, it moves back outward again to circuits 6 and 5, Mind and Communication, before arriving, almost without warning, at the centre-point, or Mastery. Hence it may likewise seem hard to let go from the sense of quiet certainty at the end of circuit 7, Meditation, and move on ‘outward’ to circuit 6, Mind; or, for that matter, to keep going at all when we hit ‘the dark night of the soul’ – classically, the day before the skills-exam – at the end of the outermost circuit, Survival. One of the classic Newage Nuisance mistakes happens right at the start of the learning-process – mistaking ‘Beginner’s luck‘ for real mastery. If we look at the labyrinth layout, though, we’ll see that this is just the first of three places where anyone on the path will seem to be very close to the centre. The other two are at the start of circuit 4, Caring, and of circuit 7, Meditation – which, in their guise as ‘the path of Heart‘ and ‘the path of Spirit‘ respectively, are likewise classic sources for New Age-style delusions of ‘instant mastery’. Fact is that there’s only one path through the labyrinth – and we can’t skip any of it if we want to achieve real mastery of a skill. Try tracing the path with your fingertips, from the opening at Beginner’s-Luck to the end at Mastery. Notice how hard it is to stay on track; notice also the sheer centrifugal force that seems to want to hurl you out of the labyrinth at that bleak ‘moment of despair‘, at the end of the Survival circuit, when you realise that you’re not only further out than everyone else in the skill, but worse than when you first started. If you do give up at that point, you’re likely to lose everything that you’ve learned; but if you can make it round that curve, through the ‘dark night of the soul‘, you’ll never lose it – it’s that close. And although working on one’s own can be lonely, the labyrinth shows there are some subtle problems from working in groups. Collaboration is important during the later interpretation phase, to build a ‘hologram’ of the results by viewing the results from many different perspectives. 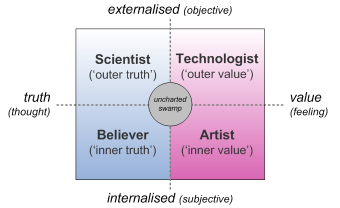 But in the exploratory stage of fieldwork or architecture-development, there can be a real problem of mutual interference from clashing expectations, and from the Possession Problem‘s all-too-natural tendency to ‘help’ others by insisting “what you’re doing is wrong – you must do it this way!” Not a sin as such, but something of which to be wary. 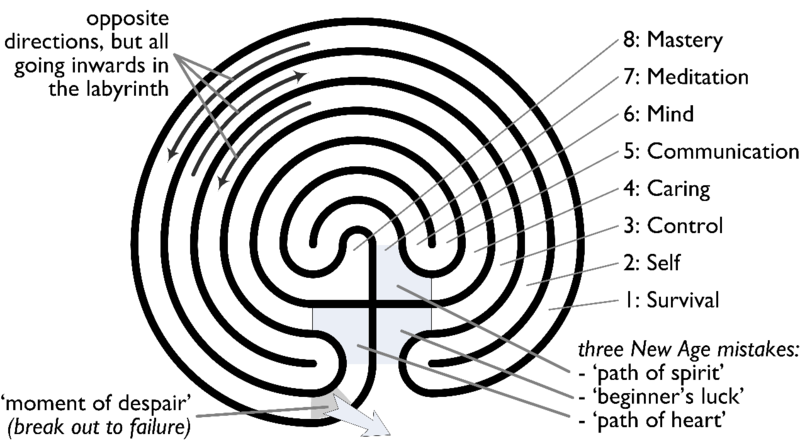 A final trap is that the whole process is recursive: we’re each traversing not just one labyrinth, but a near-infinite number of them, all intersecting with each other, layers within layers, all at the same time. 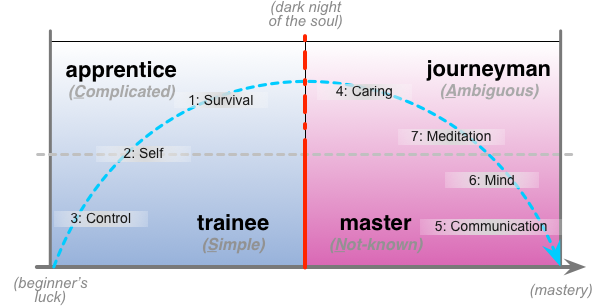 The moment we hit Mastery at one level may well be the same moment that we hit the despair of the ‘dark night’ on another – and vice versa, of course. There’s no avoiding this: we can only win if we commit to the game, and the only escape-route would cause us to lose the lot. So despite the roller-coaster ride, the wild twists and turns, the labyrinth shows there’s just one simple way to improve the skill, and the quality of the work. 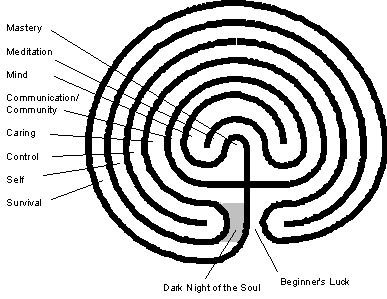 To stay un-lost in the learning-labyrinth, all we have to do is to keep going, keep going, one step at a time. As shown the diagram above, the classic sequence uses the term ‘incompetence’ to describe lesser capability and/or ability to work without supervision. This can be somewhat misleading: there’s a crucial difference between non-competence – a lack of ability – versus incompetence – pretending to have an ability that one does not in fact have. (See the post ‘Competence, non-competence and incompetence‘ for more detail on this.) Non-competence is not a ‘sin’, in the sense that we’re using the term ‘sin’ here: it’s just a capability-concern that we’re working on in the respective skills-development. 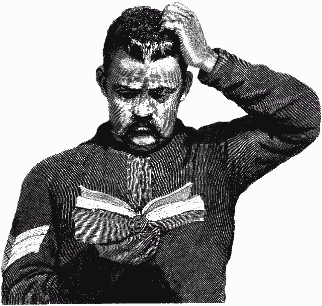 Incompetence, however, most definitely is a ‘sin’ – most likely driven by the Possession Problem, the Newage Nuisance or the Meaning Mistake. 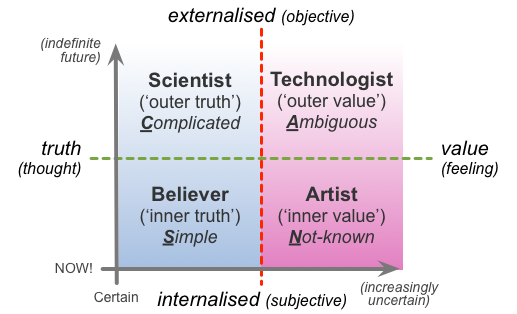 And throughout all of this, we also have to maintain the right balance of the Reality Risk – because the whole core of developing a skill consists of tricking ourselves into doing something that, at present, we do not have the competence or confidence to do. A few quick glances at the crossmaps above, and the various other descriptions in the previous posts in this series, should make it clear that the whole skills-learning process is rife with opportunities to fall into any and all of the other ‘sins’ – perhaps especially the Newage Nuisance, the Meaning Mistake and the Possession Problem, as mentioned earlier above. The other challenge here is to keep aware and (self)-honest about our actual skills and capabilities at each point. We need to use the ‘good’ side of the Reality Risk to keep pushing ourselves onward: yet if we get the balance wrong, and/or our assessment of our abilities too far wrong, we also risk either falling into ‘illusory superiority‘ (the Dunning-Kreuger Effect) on one side, or the Impostor Syndrome on the other – each of which are skills-related ‘sins’ in their own right. Learning new skills demands discipline in every sense – including discipline in the sensemaking / decision-making / action loop that underpins the learning-process. The ‘sins’ are always there – the ‘sins of dubious discipline’ – and likewise the risks that arise from them: it’s our job to keep them at bay as best we can. That’s about all that needs to be said, really. Anyway, let’s leave those concerns about getting Lost In The Learning Labyrinth at that for now – and move on to wrap up this series on ‘sins of dubious discipline’.